Another point: How do you guys begin? I am honestly clueless. Every time I begin to write something I feel like I am boasting about my abilities and it makes me feel really weird. Could it be I am not ready to come to terms with the abilities I do have? Because it is easier to ignore them in order to supress my failures or successes in the kitchen and in life? Well At least his recipe for this Autumn harvest ice cream sandwich is not as complex as my mind. Even though it is summer here in Australia, we have still an a abundant amount of winter produce lying about. You know, pumpkin, sweet potatoes, cabbages etc.. I wonder why cherry, mango and berry is season is late this year? Anyway! 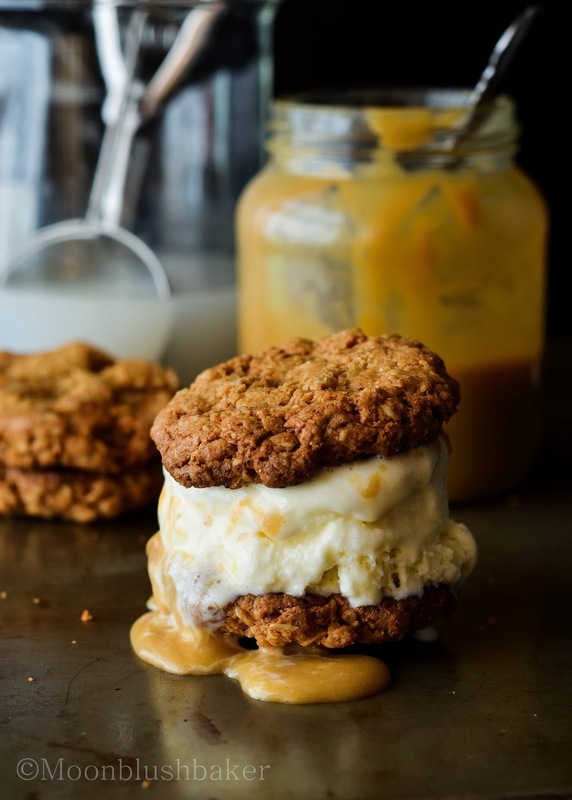 This is a cookie sandwich which takes advantage of the best of flavours of Autumn, pairs it with a Summer favourite and brings that unique taste of childhood. The cookie is modelled after the classic soft baked oatmeal cookie which features a spice surprise. As much as I adore the pillow softness of soft set oatmeal cookies; I finding I am craving a bit of crunch in the mix. To solve this I took inspiration from the corn flake crunch by the momofuku bar and flavoured bite size clutters of rice bubbles with a mix of freeze dried apple piece, cinnamon and all spice. The malted undertones of golden syrup and whole grains are given extra dimension with the texture of the spice clutters; this means you are not just biting into a cookie with no substance. While these are soft in the middle, they have thin crust which means your cookie will not dissolve in the ice cream, a problem if you live in hot climate. Now the sauce is an extra bit of new discovery for me; Permission caramel sauce. Much like other fruit or Veggie flavoured caramel sauces it involves stirring the juice or puree of the fruit in the final stages. Pumpkin needs a break right? Also fruit covered it in cream, butter and caramelised sugar is too hard to beat. This is a serious fall dessert, made for just you or many, be rest assured that people will be coming back for more. Creamy, sweet and chewy plus crunch; I have almost covered all the textures here! In a medium bowl, place your rice puffs, apples, milk powder, sugar, spices and salt. Gently mix it with your hands. Add butter; gently mix with your hands or spoon until you get clutters in the mix. On a lined sheet pan, spread clusters and bake for 20 minutes. Cool completely before storing in an air tight tin. In your stand mixer cream butter and sugar for 5 minutes or until light and fluffy. Add your egg and vanilla then beat again for 2 minutes. In separate bowl shift your flour, bi carb, and salt. Add this flour mix to the cream butter. Mix until to just combined. 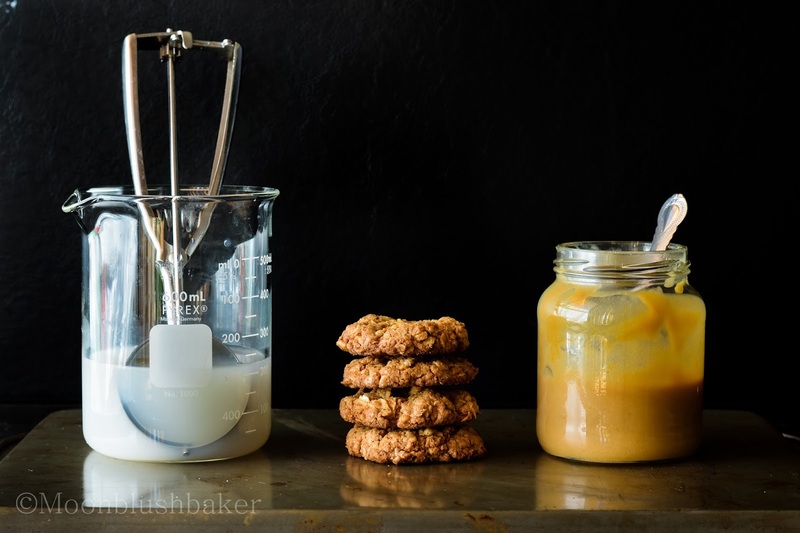 Add your oats and ginger clutters and fold to combine. Cover with cling film and place in the fridge for 24 hours. When ready to bake line two baking trays with baking paper. Place 2 teaspoon sized balls of mix on your tray, leaving a gap of 5cm. Bake for 10 minutes or until the edges are crisp. barely adapted from passion fruit caramel on Taste.com. Replace the passion fruit in recipe with an equal amount of Persimmon puree. Stir the water and sugar in a saucepan over low heat for 4 minutes or until sugar dissolves. Bring to the boil. Simmer, without stirring, brushing the sides of the pan with a wet pastry brush occasionally, for 6 minutes or until golden. Remove from heat. Carefully add the extra butter and remaining persimmon puree and stir to combine. Set aside until the bubbles subside. Transfer to a heatproof bowl and set aside to cool completely. Take one cookie and place a scoop of ice cream on top. 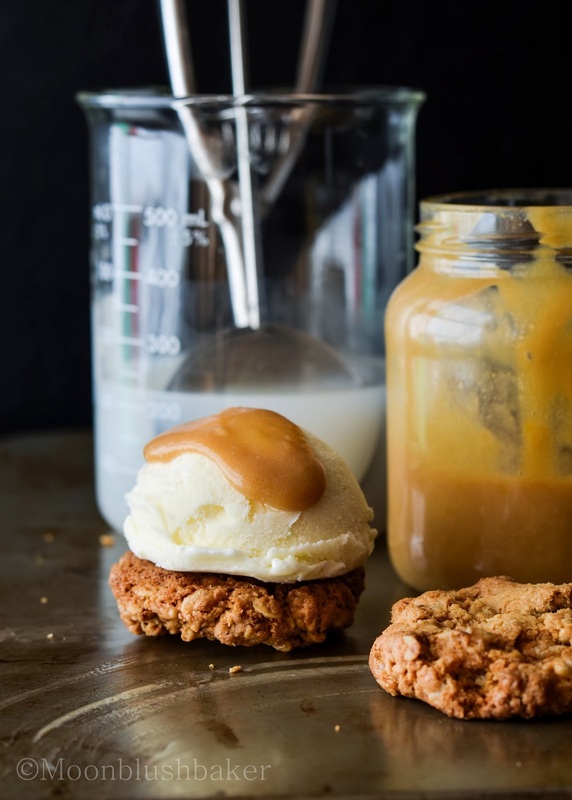 Place 1 table spoon of pumpkin caramel sauce on top then place another cookie to finish the sandwich. I am really happy you commented, it gave me a little more confidence! I can’t speak for Australia, but in the US most jobs are found through friends, or friends of friends, or friends of friends of friends…. I’m certainly not expert on baking, hiring bakers, or getting a first job out of college, but I think you will be fine if you keep reminding yourself that you want to be a baker, that you can do the job, and that you would be good as a co-worker. In the end, these are the three criteria by which I evaluate all candidates. * Start talking to people who run shops that you admire. Do not ask for a job — people often are uncomfortable with such direct requests — but do ask whether your goals are reasonable and attainable, request advice in reaching them, and finally, ask if they know anyone who might be able to give you more information. People want to help others; they will be happy if they can help move you closer to your goals, and not saddened by being unable to employ you themselves. * Exploit your skills: find local bakeries with mediocre web sites, photography, etc. Offer your services, possibly in trade for several days training or practical experience. I do not like to recommend working for free (it is even illegal in many circumstances here), but if the work is a trade for experience, it may be worthwhile. Many chefs “stage” as part of their professional training. Good luck. In the end, you will be working for 30 or 40 years. You may switch careers several times. And try to find a job that makes you happy (or that you can live with) because if it doesn’t, those 30-40 years will be exceedingly unpleasant. WOW!!!! Ken m your insight into the industry is simply astounding. I can not thank you enough for the advice! Seriously I think i might be using some of these techniques soon to obtain experience. I know my career path may change but for now I am convinced this is what I want to do. Whether I peel onions all day long, as Long as I get a foot in the kitchen industry I will be happy. I struggle to sell myself too – it’s tough! But once you start writing, the words usually flow. Your ice cream sandwiches look scrumptious! Oh wow… your ice cream sandwiches look sooo good! I can eat this for lunch! 😀 You’re still so young and I hope you will give yourself a chance to do what you love! You never know until you actually go for it. You’re very talented (I’m sure all of us agree here) and hope your job will be something you enjoy – then you won’t feel it’s “work”! Not everyone has the chance to do what you love…but when you feel like you can do it, you should give it a try! Good luck! Thank you for saying I am talented, It means a lot coming from you and how you built a successful business from your blog. I am admire you greatly. 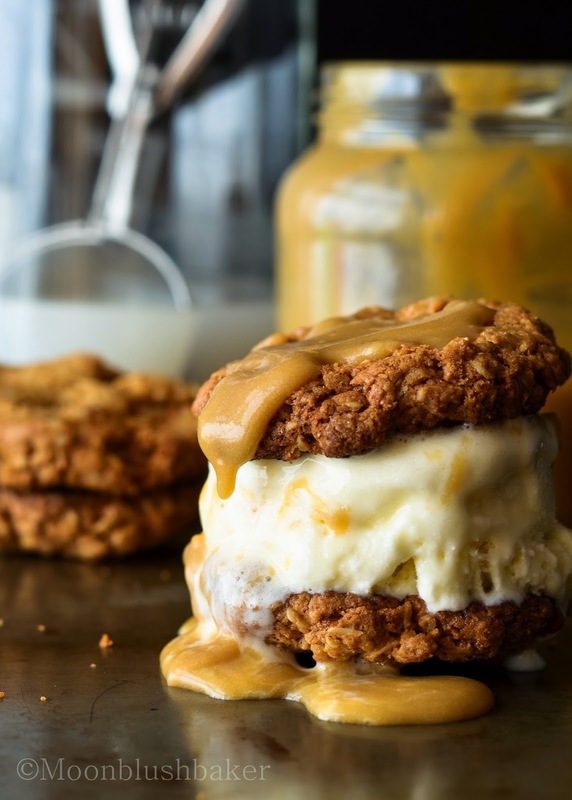 I’ve recently made a chocolate chip cookie ice cream sandwich, with salted caramel sauce, that was to die for. I’ve recently just graduated from Uni and started my first real job. It’s been amazing so far, and I’m sure you’ll find something that suits you! It is actually a persimmon sauce but caramel will work here too. It took me a while to find my feet at Uni, I hope you made the most out of it too. Seems like you know your stuff Taffy! Ooh! I’ve made passion fruit and guava caramels before, but never persimmon; this is have to try! I’m obsessed with momofuku so I’m sure I would go crazy for these cookies! Yes it flavour burst! I simply love it. Heya! Writing the resume is not as hard as you think. Look up some sample resumes on the net as a starting point. It will give you an idea and a framework that you can change to your taste and with detail. Remember your blog is a free-standing resume all on it own. You just have to pick bits and pieces that you have already put up here in your accomplishments. Also, I agree with Ken – it is a network based market these days and if you directly ask for a job it discomfits people. I would also suggest taking a couple of creations that you are most confident of and ask the pastry chef for his thoughts on it and how could improve. Alternately, you can also make something that you have difficulty with and ask to improve. Believe in your self! You will be awesome then! Thank you. your advice is invaluable! I have been networking with several cooking schools and networking through companies on end of year company gifts and party cakes. So I hope can use those!